BAF Shaheen College KG & Class One Admission Lottery Result will be declared on 5th December, 2015 at 10:00 AM. BAF Shaheen College Class One Admission Notice was published earlier. Shaheen College Class One Admission Result will be determined through a lottery. 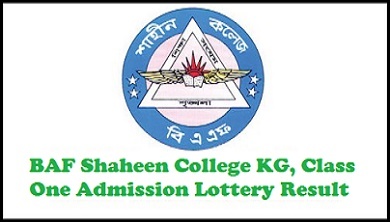 BAF Shaheen College Class One Lottery Result will be published in the college notice board. The Class One Admission Lottery Result will also be published in the official website of BAF Shaheen College. BAF Shaheen College Class One Admission Notice was published on 12th October,2015. Shaheen College Admission Process started from 18th October through the distribution of admission form. Students will be admitted to class one in both morning shift and day shift. Admission Forms can be collected till 4th November, 2015. The last date for the application submission is 5th November, 2015. BAF Shaheen College KG One Admission Lottery Result will be published on 5th December, 2015. There will be no admission test for Shaheen College Class One admission. Students will be selected through a lottery arranged by the college authority. How to get BAF Shaheen College KG class one admission result 2016? BAF Shaheen College KG One Lottery Result for Bangla Medium & English Version will be published at the same time. BAF Shaheen Admission Lottery will be held on 5th December, 2015 at 10:00 am at BAF Shaheen College premises. It is not mandatory for the applicants to be present on that day. A parent on behalf of applicant can be present during the lottery process. BAF Shaheen KG, Class One Admission Lottery Result will be published on www.bafsd.sd.bd as well as in our website www.nuexamresult.com.